Western blot analysis of total cell lysates from P3HR-1 and Ramos cells using AID (EK2 5G9) Rat mAb. Secondary Antibody Conjugated to HRP: Anti-rat IgG, HRP-linked Antibody (#7077). Incubate membrane with Anti-rat IgG, HRP-linked Antibody (#7077 at 1:2000) and anti-biotin, HRP-linked Antibody (#7075 at 1:1000–1:3000) to detect biotinylated protein markers in 10 ml of blocking buffer with gentle agitation for 1 hr at room temperature. 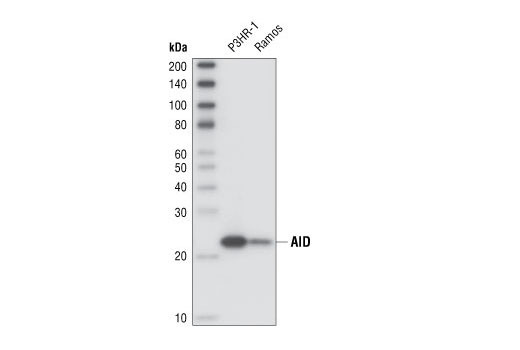 AID (EK2 5G9) Rat mAb detects endogenous levels of total AID protein. Monoclonal antibody is produced by immunizing animals with a synthetic peptide corresponding to a region surrounding Asp191 of human AID.